Is Bay Ridge Poised to Become the New Williamsburg? BROOKLYN — Will Bay Ridge become the borough's next "it" neighborhood? The working-class area immortalized on the silver screen by Saturday Night Fever's disco-dancing Tony Manero represented 20 percent of Brooklyn's new development sales in the first quarter of 2014, according to a report released by real estate company MNS on Thursday. But the company's CEO Andrew Barrocas isn't ready to anoint the South Brooklyn neighborhood just yet, noting that while it saw the lion's share of the borough's new development purchases, there were only 14 such transactions in Bay Ridge. "I think it shows the lack of inventory in these other neighborhoods," Barrocas said of hot Brooklyn areas like Williamsburg. The median price-per-square-foot of new development in Bay Ridge jumped 7.4 percent over the past year, to $558 from $517, with the median home price jumping 14.5 percent to $655,498 from $560,037, the report found. That price may seems like a relative bargain compared to the $1.41 million median price for new condos in Williamsburg, where 450 units are in the pipeline. That neighborhood's median price per square foot for the first quarter of 2014 was $829, the report said. The north Brooklyn waterfront is getting so pricey that re-sales are also hitting records, Barrocas said. An apartment in the Edge, for instance, is in contract for $1,800 a square foot, he said. 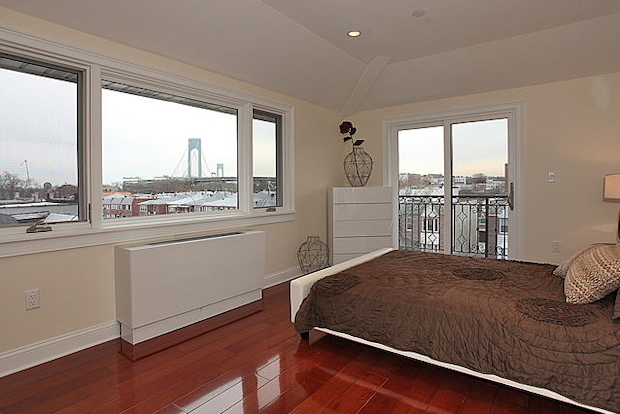 South Brooklyn may be a beneficiary of North Brooklyn’s skyrocketing prices. In fact, among the buyers at 185 Battery Ave. — one of the new projects along with 9917 Shore Rd. that helped push Bay Ridge’s new development sales in first place — were Williamsburg transplants, according to Renee Dorsa of Dorsa Group Realty. Other buyers in the eight-unit building, where prices started at $740,000, came from Brooklyn Heights and within Bay Ridge, she noted. "They came because of the amenities and quality of workmanship," she said of the building, which has parking, storage and outdoor space for each sprawling duplex. The area is undergoing a transition, with a sprinkling of upscale eateries recently sprouting, including the Italian gourmet grocery A.L. Coluccio which serves sandwiches with homemade porchetta or locally-made ricotta and the Brooklyn Beet Company, a farm-to-table restaurant with such dishes as organic quinoa trout salad and grass-fed brisket goulash. A craft beer and "artisanal" sausage bar called Lock Yard serves snacks including fried Brussels sprouts and waffle fries with raspberry barbecue sauce and goat cheese. There's also the newly-opened Coffee Lab which is bringing a taste of Williamsburg to the area, using beans from that neighborhood's roaster Toby's Estate. "My clients aren't calling about Bay Ridge – not yet," Barrocas said. "Bay Ridge is not an area we do a tremendous amount of work in, but we do cover it [in the firm's reports] because we hope one day we will be there."